Scout Madrid Hostel, Madryt, Hiszpania : Rezerwuj teraz! Hostel terms and conditions must be signed by a groups´s responsible upon arrival. 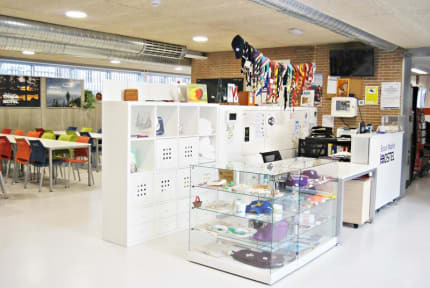 Scout Madrid Hostel is located in a fully renovated building with a modern and functional design. It is a hostel that follows the Scout values ​​and incorporating environmental, social and cultural criteria. Scout Madrid Hostel is 20 minutes in public transportation for downtown, with Vinateros Station less than 2 minutes away. The hostel has opted for the design of large and healthy spaces , seeking comfort and luminosity. And do not miss the many deals that offer you! All our bedrooms are exterior, very bright and quiet. In addition, they have: Bunk beds with single plug and light, Individual lockers, System of access to rooms with electronic lock by means of locks NFC, Shared bathrooms for easy access from the rooms, Individual air conditioning (heating and cooling),Our rooms have capacity for 6, 8 or 12 people. We have one bedroom and bathroom adapted for people with disabilities. In addition, we offer the possibility of a room exclusively for girls, and book family rooms. 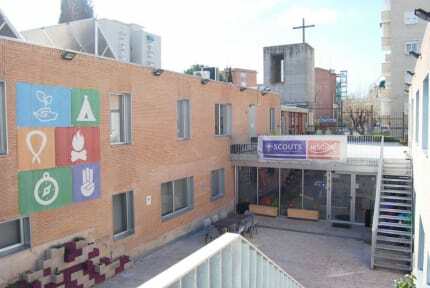 The Scout Madrid Hostel is a building next to the Parish of Our Lady of Moratalaz recently refurbished in a modern and functional design. The building is divided into two floors, surrounded by greenery and close to essential services (trade, transport, etc.). Check in from 13:00 to 06:00 .